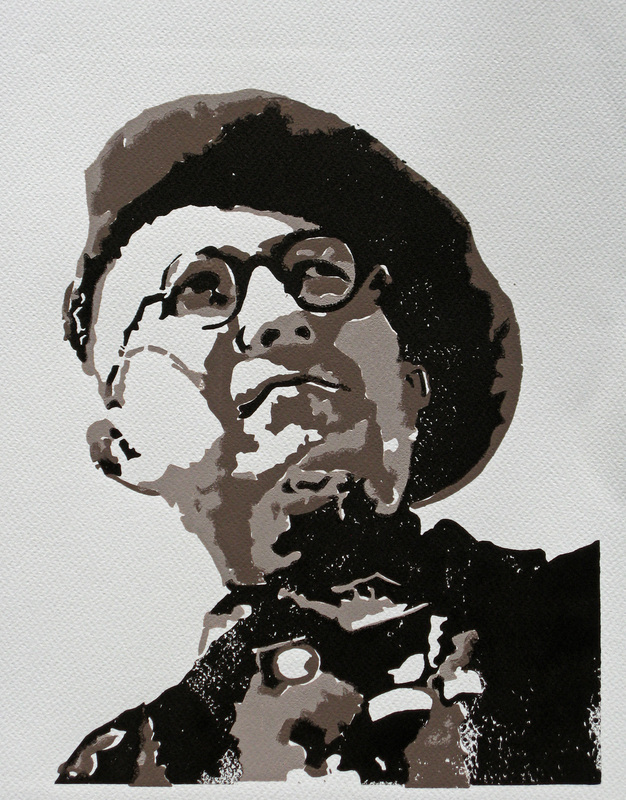 Linocuts of resistance fighters from the Haute Savoie - Why make them ? To celebrate the courage, this knowing how to live in tune with one’s heart, with a vision of the self that includes all of us. This knowing is expressed by selflessness, sacrifice up to the point of losing one's life. They did it to save with all their strength the values in which they believed. It is rare, very rare, much rarer than courageous behaviour on the spur of the moment. I have the utmost respect for them who do so, over time and at multiple risks to their life. Two of these resistance fighters, Father Louis Favre and Marianne Cohn - while incarcerated - went as far as refusing to be liberated by their networks. They declined in order to protect others from reprisals, while knowing that this choice would lead to their own deaths. The same goes for Captain Maurice Anjot, who taking over command on the Glières plateau after the assassination of Tom Morel, knew that his chances of survival were very small. He said so, bidding farewell by letter to his wife and son, before going to the plateau. And in addition there is Tom Morel, legendary leader known to all today, and Paul Lespine injured in his first battle, captured, tortured and killed at just 18 years old. And Angèle Nicollet, having worked alongside her husband Jules, she is the only survivor of the six, survivor of the Ravensbrück camp.. She lived to be 100 years. That is why I have not only made portraits, but also provide a text with each engraving, to help you appreciate these people, what they did, and what it still means for us today. 3 my desire to transcend all categories that separate us from each other; to do this job by honouring all ages, men and women, military and civilians, christians and jews. Please spend some time with these engravings, read these texts, and then talk about these lives and the choice of resistance they expressed. Marianne Cohn (1922-1944) hails from a left-leaning academic family, of German Jewish origin, but rather detached from the Jewish tradition. This family was disrupted by the arrival of Nazism. Marianne and her sister were sent to Paris. In 1941, the young Marianne entered the resistance. From September 1942 to January 1944, (under pseudonym of Colin) she passed groups of Jewish children to Switzerland. Arrested in 1943, she was released after three months. It is believed that the poem "I will betray tomorrow" was written during that time. 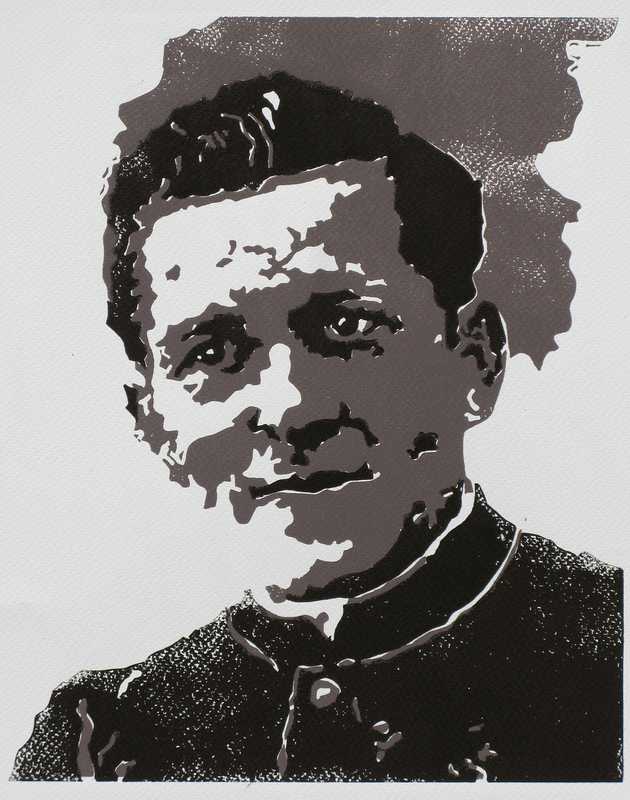 Father Louis Favre (1910-1944) taught at the Juvénat in Ville-la-Grand in September 1940. The location of the Juvénat was critical to its future involvement in the Resistance and in the passages of Jews; the school had a garden wall which borders with Switzerland. The school had its first “passages” (mainly young Dutch) as soon as late 1941. Father Favre’s involvement in the Resistance started early. His registration as an agent in the P2 intelligence network Kasanga dates to August 1942. His membership in the network of Colonel George Gilbert Groussard began in November 1942, immediately after the invasion of the free zone by the Germans. Paul Lespine (1926-1944): One autumn day in 1943, Avenue Novel, Annecy ... Paul and his group, cross a German officer. The rule in this case is to get off the sidewalk to give way. Paul does so, but not imagining that the German might understand French, he can’t stop himself from muttering a furious "Death to the cows!". The man turns around, takes the boy out of the row by his hair, throws him on the ground, assails him with kicks, leaving him unconscious on the pavement. "This is what the German army does with idiots like you” he utters readjusting his belt. He also demands the boy’s identity card. Paul is taken back to school half dead, swollen lips, a broken tooth, ribs broken. Not long thereafter, November 11, 1943, the bombing of the ball bearings factory took place. It made any victims, dead and wounded, in the zones of Loverchy and Vouvray. 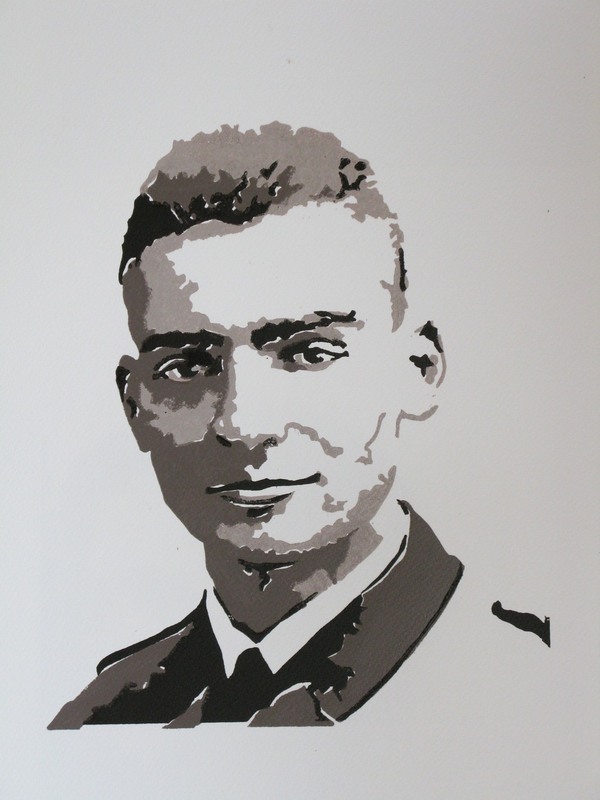 Theodosius Morel alias Tom Morel (1915-1944), Lieutenant, distinguished himself in June 1940, received two honorable mentions and was made Knight of the Legion of Honour, at the age of only 24 years old. Thereupon he served in the armistice army in Annecy under the orders of the commander of Valletta d’Osia and participated in concealing of weapons and equipment. In 1941, he was appointed as instructor at Saint-Cyr Military Academy, at the time relocated in the southern zone in Aix-en-Provence. Here Morel implicitly encouraged students to join the Resistance. Angèle Nicollet (1894-1994): Despite her five children and the dangers faced, Angèle Nicollet agreed wholeheartedly to work with her husband Jules and his friends in the resistance, and also by hiding Jewish families. She welcomed them, fed them, housed them and comforted them. In 1943, the FTP resistantce fighter, Franck Boujard de Féternes (assassinated), was with them with his radio; he was directly in touch with London and Algiers. Accordingly, many airdrops of weapons in the Chablais were prepared. And then one day, a car was seen with a goniometer framework to identify the place from where the transmissions were boadcasted to England. It had become necessary to leave in haste, guests and radio and then Jules Nicollet himself. He hid in Switzerland. One month later the Gestapo searched the house, finding no Mr. Nicollet. So they took Angèle Nicollet. ….. 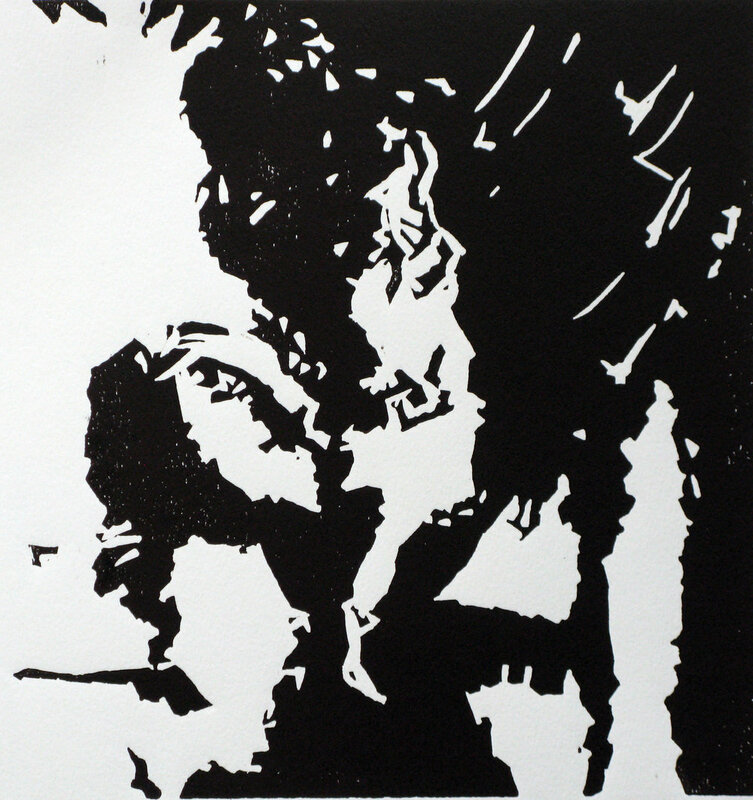 I did this subject first in Lino and then in Copper. Comparing the two engraved versions of the same original drawing illustrates some of the graphic options provided by one and the other technique. 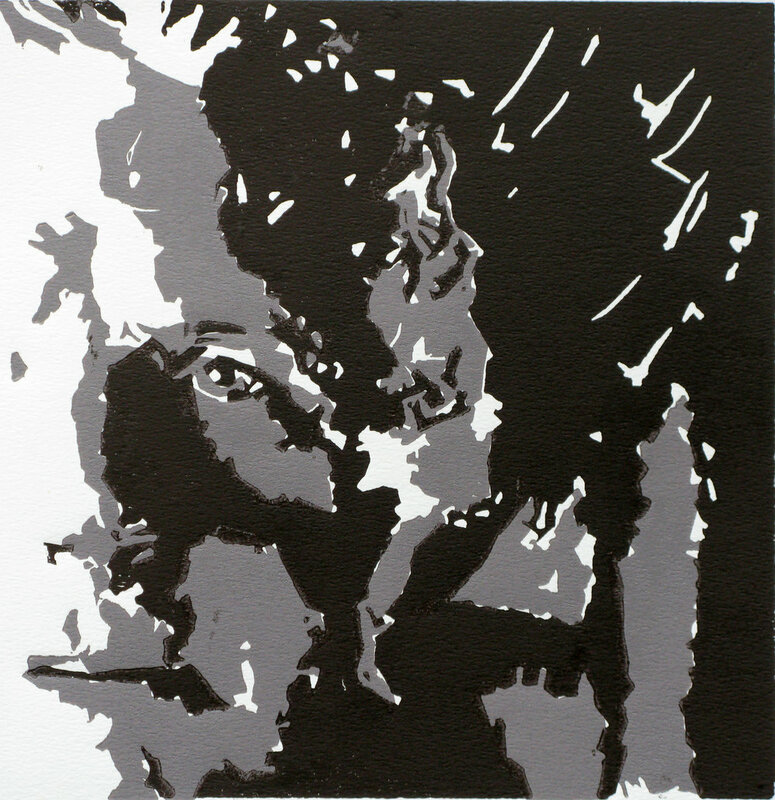 The grooves in a Lino print create the whites in a pure binary print as this one. In the copper engraving the parts that remain white in the print are the few places where the acid never touches the copper, by being covered all along by varnish. The various shades of the Copper print are the result of various parts being exposed for various lengths of time to the acid.